*Gifted I've been testing out EXFOLIN's Cleansing Pink Clay Face Mask (£10.99 - 100g)* which is formulated with Pink Clay, Rice, Rosehip, Hibiscus and Cucumber Powders. I was also gifted a masking brush (the mixing bowl is mine). Also available is their Herbal Face Elixir Oil which can be used AM or PM or a few drops can be added to the mask for extra nourishment. See the shop HERE. Products are handcrafted in small batches in Scotland and their Cleansing Pink Clay Face Mask balances acne prone, combo, sensitive and oily skins. It'll gently exfoliate, cleanse pores and remove blackheads as well as, soothing spots and blemishes. The mask is rich in vitamins and helps accelerates skin regeneration. It'll also help to minimise pores and balance the skin. To use: blend a couple of teaspoons of powder with water or hydrosol to a firmish paste. You can add a drop or two of facial oil to hydrate. Apply to the skin using the brush provided 2-3 times week before removing with a warm damp face cloth. My skin is left glowy, radiant and looking really healthy. I first discovered Maya Njie Perfumes on British Beauty Blogger and had to rush out and buy the Discovery Set (5 x 2ml - £17). Swedish founder and formulator, Maya moved to London in her late teens and studied surface design and photography at the University of Arts in London. She found that she loved experimenting with different raw materials and taught herself perfumery. After getting lots of positive comments about the perfumes she wore she decided to set up her own niche perfume brand - Maya Njie. You can buy online or directly from Liberty. The unisex perfumes (EdP) are created using essential oils, aroma compounds and resins making use of both natural and synthetics. The blends mixed in small fresh batches with care and precision and the bespoke packaging incorporates colourways extracted from family photographs. I like the concept of returning a full size empty bottle for re-filling (15% discount). You can see more information about this HERE. I totally fell head-over-heels dizzy for the glorious Les Fleurs (50ml - £85) which is a sensational floral inspired by Minnie Ripperton's song "Les Fleurs" which graced our radio airwaves in the 1970s. It has fresh green floral notes and is perfect for Spring and Summer and is really, really special. "Bergamot, the fresh citrus top note, provides a green and vigorous opening. Beneath lies fruitful, bright heart notes of sweet fig, neroli and Magnolia. It is rounded off with subtle base notes of Floral Musks and Woods". I also enjoyed Tobak, a smokey and spicy scent which has notes of Tobacco Leaf, Vetiver, Cinnamon, Tonka, Musk and Leather. It's slightly more masculine but still very wearable. Vanilj, is a light as air vanilla scent, so sweet with a hint of cardamon, patchouli, cedar and amber - delicious! Nordic Cedar contains fresh notes of cardamon along with patchouli, musk, cedarwood and amber while Tropica (think summer holidays) is a lush blend of pineapple, coconut, fig, citrus, ambergris and sandalwood. There's an offer running until 23 April to get 15% off your order CELEBRATE15 to celebrate 1,000 online orders to date. And so.... I had to pick up my absolute favourite from the collection in single pocket perfume size (7.5ml - £22). You know, I will buy this full size next time! Have you tried Maya Njie Perfumes yet? *AD/Gifted. Sent to me as part of the Love Lula Accredited Blogger Program. My post contains 2 affiliate links. I love seeing the new brands Love Lula bring to the store. I couldn't resist trying AYAN, which is a Bulgarian company founded by Yana. She creates high-performance natural skin, hair and body care products which are formulated with minimal ingredients, are certified organic, natural, safe and ecologically friendly. The products are enriched with the finest lavender oil which comes directly from their lavender fields. I've been trying two products from the indulgent and pampering line. Packaging is recyclable or re-useable. AYAN Relaxing Shower Gel with Lavender (200ml - £12.99) is a rich and luxurious wash which has a light and natural Lavender scent. Formulated with 75% certified organic ingredients. To use: apply to damp skin in the bath or shower. I've been really impressed with this lovely shower gel which calms and relaxes both the body and mind. It's perfect to use before bed for a restful night's sleep. I think it would also be nice to use after a day's sunbathing to refresh and calm the skin. And yes, samples sizes are always the best! Love Lula offer a great sample service (with purchase) and the little try me pot cost me 50p (and yes, I fell totally in love!). AYAN Multi-Lavender Butter Body-Hands-Feet (100ml - £14.99) is packed in a re-useable tin. A rich formulation which includes homegrown Lavender Oil, Shea Butter, Coconut and Macadamia Oils deeply nourishes the skin on the body, hands and feet. To use: apply as liberally as needed. I love this! Rich and luxurious the butter melts instantly onto dry skin leaving it nourished and delicately scented. Have you used any AYAN products yet? AYUNA won Best Natural Organic Brand International (Spain) and every product I tried I loved. That packaging too, simply stunning. Winners in Beauty - Editor's Choice was their Balm Volcanic Revitalising Mask plus their Essence High Protein Cream-in-Oil Peel. I loved trying both of these products. In the Wellbeing Awards, Laviish Smile Teeth Whitening Polish won an Editor's Choice Awards. I loved the quirky packaging (think shoe polish!) and found the results good - my teeth felt deeply cleaned and my mouth refreshed. I'm a huge fan already of Esse Probiotic Skincare and their Cocoa Exfoliator won in the Editor's Choice category. See my review HERE. Totally new to me is Love Absolute and I enjoyed all the products I tried from the brand. They picked up Editor's Choice awards for their Lavish Cold Cream & Cleanser and Facial Radiance Oil Serum. Lovely o.Moi was initially discovered in my Skin Organics Clean Beauty Box in September. Their Plump it Up Facial Cream and All-in-One Balm won Editor's Choice awards. Picking up Editor's Choices awards were three simply stunning face oils - La Belle Lune - a rich organic oil which is perfect to use at night to awaken with beautifully soft, hydrated and plumped skin. I'd been dying to try So27 Skincare's Rewind Night Oil which is formulated with skin loving oils (and smells glorious). Awaken with plumped and nourished skin. The third winner is Temple Spa's luscious Neroli scented It's All Good Nutritious Boost Facial Oil which was a joy to use. Also picking up Editor's Choice Awards were a brand I hadn't heard of before - Endor Technologies. Their Anti-Cellulite Cream was rich and luxurious and melted quickly onto dry skin while their Anti-Ageing Eye Cream smoothed out and plumped lines and wrinkles. Receiving a Commended Award was Pure Savvy's Come Hell or High Water 3-in-1 Micellar Water which I loved. I found it refreshing and loved the light rose scent. It was nice to use to cleanse and refresh the skin and it'd be perfect to pack for summer holidays (I also loved their Multi-Tasker Beauty Balm which is scented with neroli and sweet orange). You can see the whole list of winners HERE. When Penhaligon's Fragrance Quiz popped up on my Facebook feed I went to investigate..
My two sample vials arrived at the end of last week. Beautifully packaged (in a letterbox friendly box), with a voucher code for £5.50 (the price of the two vials) off a full size bottle. From the PORTRAITS collection I was very pleased when The Coveted Duchess Rose EdP popped up (£188 - 75ml). It's truly exquisite and deeply rosy and is a blend of Mandarin, Rose and Musky Woods and yes, full size is on the wishlist - it's simply stunning. My second choice was the classic, Orange Blossom EdT (£59 - 30ml) which is reminiscent of "orange orchards in bloom". Think honeyed notes of white blooms with Lemon, Cedrat, Violet Leaf, pink berries, Orange, Bergamot, Peach Flowers, Rose, Tuberose, Jasmine, Vanilla and Musks - it's luscious. I think the Fragrance Quiz is a great way to try new perfumes (or perfumes which are out of your reach price wise). What's your favourite perfume from Penhaligon's? *AD/Gifted It's always an exciting day when my Love Lula Beauty Box arrives! This month's box is absolutely fantastic. As ever, there is a very generous 25% discount for any of the brands in the box this month. The first thing which caught my eye was Dr Botanicals Lemon Superfood all-in-one Rescue Butter (50ml - £19) which is a brand new product from the brand. It smells simply incredible and melts instantly onto the skin. Use as a moisturiser on the face and body, on dry and cracked areas such as elbows, knees, feet and lips or as a cleanser (avoiding eye area). I do love a multi-use product and I'm looking forward to testing it out. From lovely Gallinée is their La Culture Probiotic Body Milk (200ml - £28) which I've used before. See my review HERE. There's a beautiful shade of bright pink Glossworks Nail Polish in Raspberry Parade (9ml - £12) which will be perfect for summer painted toes (or nails)! From Alteya Organics is their Chamomile Water (120ml - £7.95) which has a bit of an acquired scent! The final two items are sachet samples by Kimberley Sayer which retail at 25p each. Great try me's or for holidays. It's a great box this month, are you a subscriber? *ARC gifted. 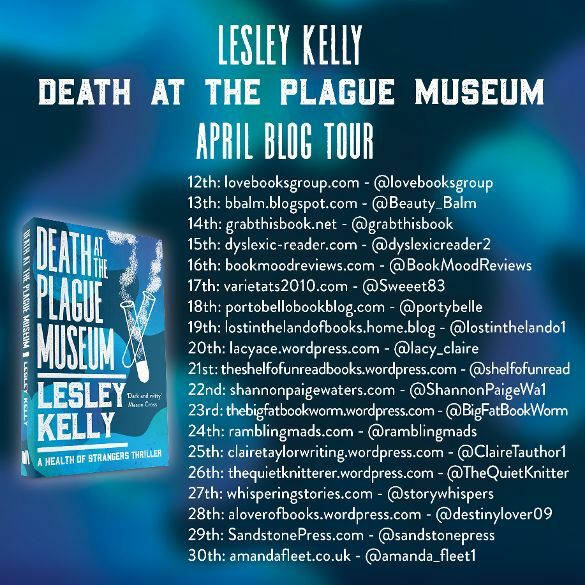 Today I'm on the Blog Tour for Lesley Kelly's third book, Death At The Plague Museum in the Health of Strangers series. On Friday, three civil servants leading Virus policy hold a secret meeting at the Museum of Plagues and Pandemics. By Monday, two are dead and one is missing. It’s up to Mona and Bernard of the Health Enforcement Team to find the missing official before panic hits the streets. The Team are shown CCTV images of something tragic which happened at the Edinburgh Museum of Plagues & Pandemics and find out that someone high up in the Scottish Government team have missed their health check. They also need to find out why that high up meeting was held there rather than at the Scottish Government buildings. The race is on for the team to find her. Meanwhile, Bernard has found out something about his friend Marcus which he's disturbed about and Mona is off on a blind date which doesn't turn out quite as expected..
Jacobsen, has let the cat out the bag about Mona and she's fuming. She's also trying to get in touch with the Prof whom we met previously. The business card he gave her has a cryptic message on it and she wants to find out what it means as it seems to be connected to Helen Sopel, who has missed her health check and others. Maitland and Bernard visit the Edinburgh Museum of Plagues and Pandemics to speak to the manager but instead meet assistant Lucy. Bernard is pretty taken with Lucy and Maitland wastes no time in teasing him. A parcel turns up at the HET Office which belongs to the Helen Sopel who's missed her health check and the contents confuse them. The box goes missing during the fake bomb threat and protest by the twittermob and Bernard leaves something in the office he shouldn't have. Mona meets the Professor and finds out exactly what "Follow the Orders of Mrs Hilda Millwood" means. The second meeting at the museum doesn't go according to plan. Bernard steps up to the plate and does something SO out of character! As ever, a fast paced story laced with humour...and that ending..WOW! Roll on book #4. My recurring subscription with Latest in Beauty is 30th of the month. Of course I couldn't resist an extra box when I saw the theme was Oh So Natural for the April Edit (and picks were my fav Schmidt's Deodorants which retail at £12 for 75g). My selection cost £18 for 9 items (sign up HERE). Aromatherapy Associates De-Stress Muscle Bath & Shower Oil 9ml (huge fan of these). This month's extra is £7 off at Bloom & Wild Letterbox Flowers. I'll post reviews when I've had a chance to try. Have you picked up a box this month yet? Jen from Cosy Wee Reads followed me on Instagram and I went straight to the website to check it out! And of course you know what happened next.... I couldn't resist signing up for a Surprise Book! (you also get 10% off you first order, although in my haste I forgot to use the code!) You can also sign up for a monthly subscription 3 months, 6 months or quarterly. The books selected are written by an author with Scottish connections or the book is set in Scotland. You can get a total surprise like I did or choose from Crime, Contemporary, Independently Published, Prize Worthy and Romance. Inside the letterbox friendly box (which is recyclable or reusable) is your wrapped book (sweet), a hot drink (from a selection of choices) and a bookmark. And, Jen chose me a book I haven't read which brought me such joy! Check it out HERE. Zing Organics: Monthly Hamper Club: Step into Spring! I'm very excited to try brand new Beautific Calm Facial Serum 15ml (£30) which contains calming and healing Blue Chamomile with "sweet and zingy" Green Mandarin. The serum will calm and heal and is perfect for skins prone to redness, dryness and allergic reactions. German Blue Chamomile has a beautiful herbal type scent. To use: take 2-3 drops, rub between palms, inhale deeply and then press onto the face, neck and around the eyes. The second and third items this month are 8hr burn candles - Spa Light Botanical Candle in Breathe Easy - Eucalyptus, Lavender & Juniper and Spa Light Botanical Candle in Summer Meadow - White Grapefruit Geranium and May Chang. The fourth item is a small gemstone which Kirsty has charged with Reiki which will "provide healing at all levels, physically, emotionally and spiritually". Pop it under your pillow or in your pocket during the day. Kirsty has especially chosen the gemstone she's most drawn to with the member in mind - which is a lovely touch. I received a lovely little green gemstone. As ever it's a great value subscription box and I'm looking forward to trying everything out properly. Reviews to follow! *AD/Gifted - sent to me as part of the Love Lula Accredited Blogger Program. My post contains one affiliate link. I've been testing out Award winning (Beauty Shortlist Awards 2019 - Editor's Choice) MALĀKO Skincare's Skin to Soul rich Body Crème Scrub (200ml - £24)* which is presented in a large luxurious glass pot. I recently reviewed their fabulous Skin to Soul Saviour Oil (REVIEW). The scrub is deliciously creamy with small raw finely crushed peach and olive seeds which act as natural exfoliants. These are blended with precious oils which are rich in antioxidants and vitamins A, B and E including Sunflower, Jojoba and Grapeseed oils. Lemongrass and Frankincense nourish and revive, heal and calm. May Chang the "Oil of Tranquility" balances. The scrub has a marzipan type scent. To use: massage onto damp skin (I've also used it on dry skin before popping into the shower) before rinsing. It leaves the skin deeply nourished. I've been enjoying using this luxurious but gentle scrub, my skin is softer and smoother with dry patches feeling more moisturised and hydrated. What's your favourite MALĀKO Skincare product? Going into month #4 with my Beauty Pie subscription. Annoyingly, several of the items I'd really wanted to try are out of stock so I'm thinking next month I'll stock up on foundations and then cancel my membership. This month (£10 membership is taken off via paypal on your renewal date) and then you pay for your purchases and postage on top. Superactive Capsules Pure Double Vitamin C & Vitamin E Serum (typical price £50 - members price £8.59) which contain a double dose of Vitamin C and will firm, smoothe out wrinkles, brighten and even skin tone. My second pick was FutureLipstick Trio in Pinks and Pops (typical price £50 - members pay £10.67). These lipsticks are gorgous! Super moisturising with long lasting colour. I'll review them in a bit. I've tried Powder Up Pink so far which gives the lips a gorgeous pop of colour. Sandwick Bay Candles theme for April's Subscription Corner is Rainwater, think April Showers and Spring Freshness. One of my greatest joys is opening subscription box on it's arrival and seeing what's inside! My Subscription Corner Box was waiting for me when I came home from meeting a friend yesterday and of course I delved straight in. Inside this month is a Rainwater Candle. Megan says "this month it has not stopped raining here in the Outer Hebrides" and the candle is a blend of woodland, powdery florals, blossom and fresh grass. It's fresh, floral and uplifting and I'm looking forward to lighting it. The extra this month is a seedbom by Kabloom and inside is a mix of compost and wild seeds to create a patch of pastel blooms. I'm going to try it up at the allotment so watch this space! As ever, Megan has created the perfect box to uplift and bring joy. I so love my Subscription Corner box. Join up HERE. I was excited to see award winning MALĀKO Skincare at Love Lula recently and snapped up their Skin to Soul Saviour Oil (£20 - 100ml) which won Editor's Choice at the recent Beauty Shortlist Awards. The oil is formulated with carefully selected natural therapeutic ingredients and the blend will uplift, relive stress and tiredness, help to speed up muscle recovery and improve the appearance of the skin as well as leaving it with a delicate sweet scent. As you'll know I love a multi-use product - use it on your hair, body, hands, in the bath.. The scent is quite sweetie-sweet initially and is a blend of reviving Lemongrass, balancing May Chang and calming Frankincense in a base of skin loving oils. The oil is lightweight and absorbs almost instantly. Lost in Scent had been on my radar for a while and when they offered a free travel size candle with a full size purchase I jumped in. Look at that exquisite packaging! I also loved the personal handwritten note (it's the little things..) The range is hand crafted with love by founders, Darrell and Andy who love travelling to far flung places and the candle scents are inspired by their travels. I also love the cards which give suggestions of music/films to inspire you while your candle is burning! For my full size (180g) I chose Big Sur which is from the Californian range and is a blend of bergamot, sage and sea salt which was created to conjure up memories of driving Route 1 taking them back to where the ocean meets the forest. I've found the candles burn very, very evenly and the scent is fairly light with a slight seashore/herbal mix (although gorgeous!) I'm thinking my next buy will be LA Moonlight, a mix of Gardenia, Leather & Tuberose. I actually gifted Birdsong Travel Candle, but it's scented with Freesia, Rose and Pear and is the perfect candle for burning in Spring & Summer - think lush florals, fruits and green notes. I love the packaging and the fact that they give a portion of profits to charity. I'll definitely be back to pick up MORE. 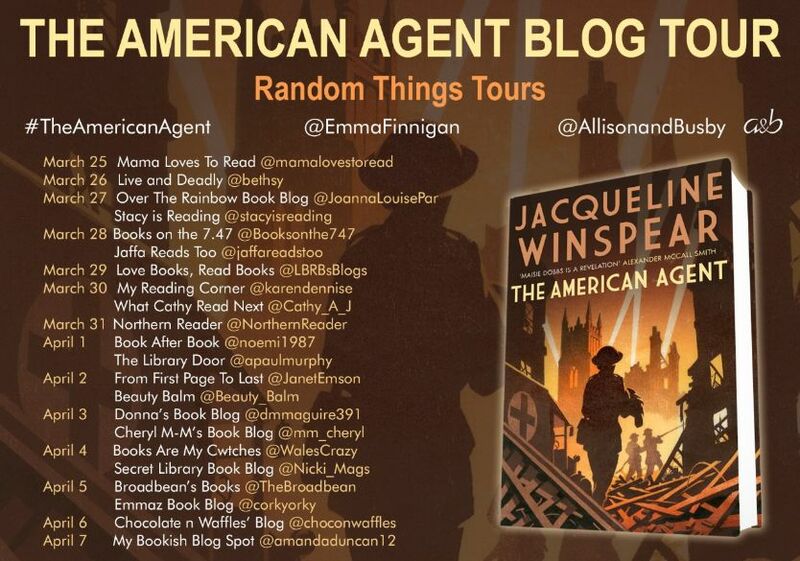 I'm on the blog tour today for the fabulous The American Agent by Jacqueline Winspear*. 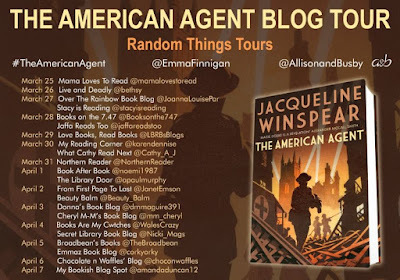 When I signed up to the blog tour it didn't click it was book #15 of a series but I've fallen head-over-heels for Maisie Dobbs so will definitely go back and start at the beginning (in fact, book #1 is currently nestling on my kindle). 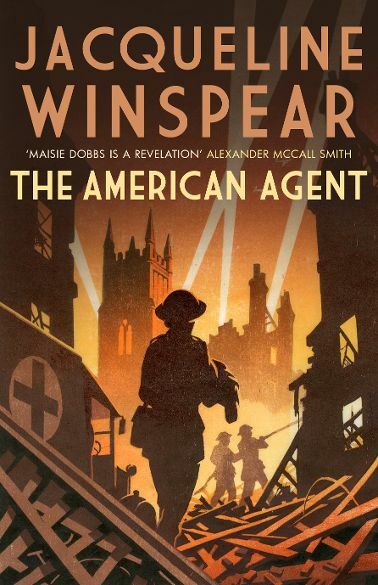 "Beloved heroine Maisie Dobbs, “one of the great fictional heroines” (Parade), investigates the mysterious murder of an American war correspondent in London during the Blitz in a page-turning tale of love and war, terror and survival. As the Germans unleash the full terror of their blitzkrieg upon the British Isles, raining death and destruction from the skies, Maisie must balance the demands of solving this dangerous case with her need to protect Anna, the young evacuee she has grown to love and wants to adopt. Entangled in an investigation linked to the power of wartime propaganda and American political intrigue being played out in Britain, Maisie will face losing her dearest friend—and the possibility that she might be falling in love again". I absolutely fell head-over-heels for Maisie Dobbs, I just loved her character and can't wait to read the other books. 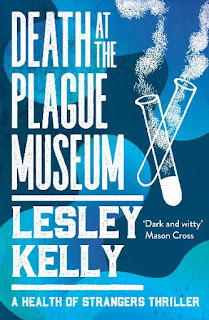 In this story Maisie, a Private Investigator has been drafted in by the British and American governments to find out how and why young American reporter, Catherine Saxon has been brutally murdered. She's being assisted by Agent, Mark Scott whom she's met before. The story takes place through the Blitz in London and Maisie and her friend, Priscilla put themselves in danger every night driving ambulances all over the city to those who need medical attention. I loved the characters and the timeframe and the jump from the city down to the country and her family including evacuee Anna whom she's taken into her heart and then back to London to her offices and assistants, Billy and Sandra. There are some things mentioned from previous books (which makes me all the more eager to dive into the series from the start) but nothing which makes the story unreadable - if fact I think it could be read as a standalone as I did. There are twists and turns and the race is on to find out who the killer is and it's someone whom I didn't expect! A great read which I really enjoyed.